All craft artists work within a tradition. It is difficult for them to separate themselves from the deeply rooted traditions of the past or the craft artists who have come before them. However, in every generation some craft artists seeks to push boundaries; change the art form in his or her own way. In this section of Education Guide: Community, students will deepen their knowledge and understanding of continuity and change as seen through the work of Richard Notkin and Einar and Jamex de la Torre. These artists push the limits of their materials and subject matter, but do so within the longstanding traditions of craft. I’m trying to make pots that have a separate cultural identity [than Yixing pots] that speak of my times, my country, my concerns. Traditions are an important part of our lives. Birthdays, weddings, anniversaries, and holidays are just some of the many cultural and religious traditions we celebrate. These traditions become part of our lives at birth, and as we grow older we go from being a participant in the tradition to being responsible for carrying on the tradition. But why are traditions important to us? What meaning do they have? Why do we feel the need to continue them? Is it okay to change them? These simple questions have complex answers deeply rooted in our personal, familial, and cultural ties and identities. More often than not, traditions are simply a way for us to stay connected to our heritage, and often are such a part of everyday life that we rarely stop to think about their importance to us. For many, what is important is that traditions continue. Few want to break with tradition. But there are those who, for whatever reason, do feel the need to break or at least modify the tradition. Is this a bad thing? Is it wrong to question a tradition? 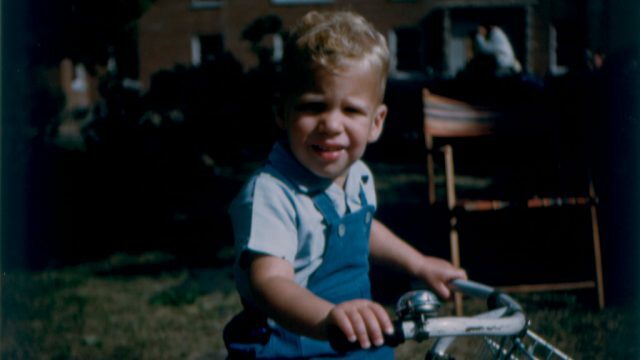 Is it wrong to change or break with a tradition to better suit your beliefs or lifestyle? In some instances, changing a long-standing tradition (e.g., a senior class trip, homecoming, or birthday ritual) is seen as a disrespectful to one’s forebears. But for others, changing the meal served at Thanksgiving or having a non-traditional wedding would be welcome or even necessary. By changing a tradition, some people feel they can better express their beliefs, who they are. Their intent is not to disrespect what has come before, but simply to question it. And whether we realize it or not, every generation, in some large or small way, changes what has come before, creating a new tradition that future generations will surely want to change. Traditions can be firmly rooted in our own personal, familial, and cultural beliefs, but we can also borrow from other cultures and combine aspects of them with our own traditions to express our creative vision. While ceramic artist Richard Notkin works within the long tradition of clay, that for centuries has included the making of teapots, he also borrows from other cultures. Notkin puts his own spin on teapots by completely redefining their purpose without compromising their essential form (body, spout, handle, lid, and knob) or materials (clay). Notkin’s teapots clearly express his own creative vision while paying homage to the small-scale, delicate teapots of the Chinese Yixing tradition that, like Notkin’s work, express a narrative element. But Notkin’s teapots push the idea of functional pottery to the edge. He uses his work to express his social and political views about past and contemporary civilization. He transforms a simple vessel rooted in tradition into a sculptural form that redefines our understanding of what a teapot can and should be. Notkin’s teapots are truly about continuity and change, reaching back thousands of years to an ancient tradition and, with respect and understanding, changing the tradition to express his contemporary views. All the while he remains true to the handcrafted form and materials of the teapot. What happens when you take Mexican traditions, mix in a little American pop culture, add social commentary and stir in a pinch of humor? The result is the glass sculptures and installations created by Einar and Jamex de la Torre. Living in both California and Mexico facilitates the brothers’ ability to juxtapose their ancestry with American popular culture. Their work reaches far into the past, referencing Aztec gods and Mexican folk art while addressing contemporary political and economic issues. They struggle to make sense of the world around them and the culture into which they were born. Every day they question traditions, theirs and those of others, through the subject matter of their work. But where is the continuity? While they work within the tradition of glass blowing, they have chosen to chart their own course in terms of how they use the medium, to express their creative visions. They push the limits of glassblowing as others who came before them did; however, despite their forays into uncharted territory, they remain committed to the continuity of the medium through their processes and techniques. While the results may not be traditional in either subject matter or form, their methods date back thousands of years. Like other craft artists, they have a deep respect for the long tradition of glassblowing. For the de la Torre brothers, continuity and change is what allows them to experiment, to work outside the traditional limits of glass. All craft artists work within a tradition. It is sometimes difficult for them to separate themselves entirely from deeply rooted traditions of the past or the craft artists who have come before them. It is through tradition that the knowledge and understanding of materials, processes, and techniques are passed down from generation to generation, artist to artist. But change is also important. In every generation of craft there are artists who push the boundaries and seek to change its art form. Richard Notkin and Einar and Jamex de la Torre push the limits of their materials and subject matter. These artists do what they do because their creative visions are important to them. To realize these visions, they must redefine traditions, but they do so with respect and understanding. Changes are by no means made simply for the sake of change. Have students view the DVD segment featuring Richard Notkin (clay/Community) or view online at www.craftinamerica.org/shorts/richard-notkin-segment. After viewing, engage the students in a conversation about his work focusing on the teapots: What are some of the things he makes? Are the teapots really teapots? When speaking about the teapot, Notkin calls it “the most complex of vessels, consisting of body, handle, spout, lid and knob.” Do you agree that those are the basic parts of every teapot? Do all of his teapots have these basic parts? In what way are the materials traditional and in what way are they not? Help students understand that Notkin works with traditional materials. What is the primary function of Notkin’s teapots? In what ways does Notkin break away from the tradition of teapots? Help students understand that, due to complexity of design, Notkin’s teapots are not used for serving tea, but rather, he uses them to make a socio-political statements about the state of our world. Now have students view the DVD segment on Einar and Jamex de la Torre (glass/Community) or view online at www.craftinamerica.org/ondeck/shorts/pilchuck-glass-school-segment. Before viewing, ask students: What comes to mind when you think about objects made of glass? Have them consider the following question while viewing the segment: How does their work break away from traditional uses of glass? 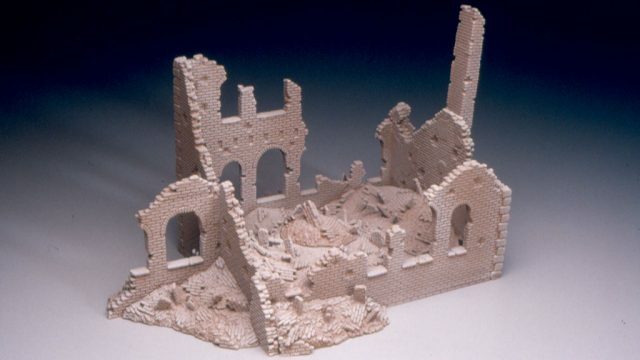 After viewing, engage students in a conversation about the de la Torre brothers’ work. How do they work within the tradition of glassblowing? How do they push the boundaries of the tradition in terms form, scale, function, and subject matter? 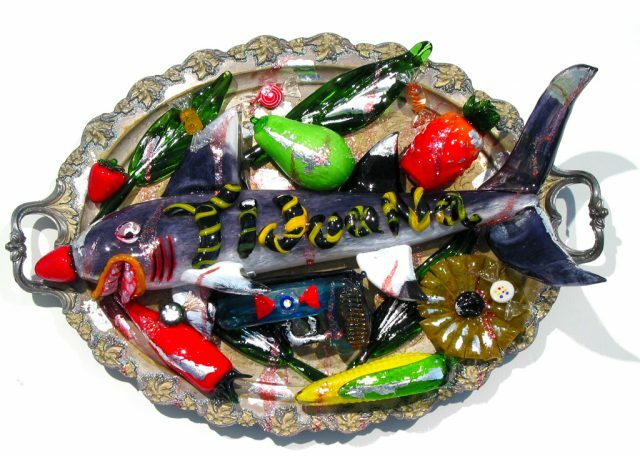 What is the primary function of the de la Torre brothers’ glass work? In what ways does it break away from the tradition of glass? View additional DVD and web segments on featured artists Richard Notkin and Einar and Jamex de la Torre. Examine DVD or web segments for other artists and art forms that explore the theme Continuity and Change, including Pat Courtney Gold (basket maker/MEMORY) and Jan Yager (jewelry/LANDSCAPE). For each artist ask: What is the tradition of which this work is a part? Have students consider form, materials, and function as they answer the question: How does the artist continue the tradition and/or push the boundaries? 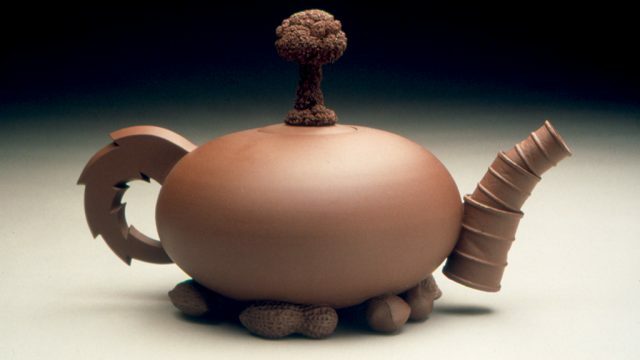 Find various images of Richard Notkin’s teapots on the Web. Print out enough images for students to work in small groups, or choose three teapots and make enough photocopies for each group to have one image. Ask students to investigate the teapot by looking at it closely and discussing it with their group. Have them write their observations directly on the sheet. They should indicate the different parts of the teapot, identifying the symbols Notkin uses and the message(s) he is conveying. After they have finished annotating the images, have students share what they learned about the artist, his use of materials, subject matter, and his intent. If possible, make links between Notkin’s teapots (either the traditional form or the messages) and what they are studying in history class. 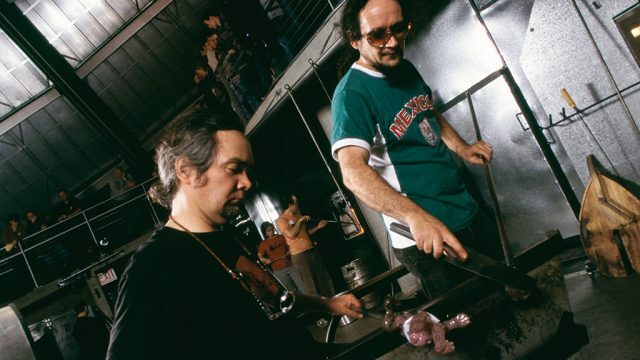 Find various images of Einar and Jamex de la Torre and Dale Chihuly on the Web. As with the previous activity, print out enough images for students to work in small groups, or choose three artworks for each artist and make enough copies so that each group can have a de la Torre image and a Chihuly image. Ask students to investigate the artworks by looking at them closely and discussing them with their group. Have them write their observations directly on the sheets. They should note the materials, the forms, subject matter, and the intent of the artworks. Additionally, students should create a word bank–a list of words they would use to describe both artworks. After they have finished annotating the images, have students share what they learned about the artists, their use of material, subject matter, art forms, and intent. Then have them share the words they generated about each artwork. Engage the students in a discussion comparing and contrasting the work of the de la Torre brothers and Chihuly. Broaden the discussion by including the work of Richard Notkin. In this activity students will experience first hand the process of breaking with tradition. Begin by finding examples of various chairs on the Craft in America website. Possible artists to include are Jon Brooks, John Cederquist, Michael Cooper, Tom Ekert, Wendy Maruyama, Alphonse Mattia, Tommy Simpson, Rosanne Somerson, Therman Statom, etc. Show the images to students online, or print them. Engage them in a discussion about similarities and differences in form, materials, and function. How does each artist’s chair break with tradition? Give each student a photocopy of a traditional basic chair. Have them use tracing paper to experiment with ways to alter the chair. Provide prompts: Beyond being a place to sit, what other function could this chair provide? Based on its new function, what would the form be like? What materials do you need to alter the chair? They should try several variations before arriving at a final design. Once they have a plan, they should make their chairs. This can be done using foam core or cardboard as a base to make a small maquette, or they can use real chairs and alter them. When their artworks are complete, have them title and display them. Discuss the experience of breaking away from tradition. Find images of traditional weavings on the Craft in America website or on other websites. 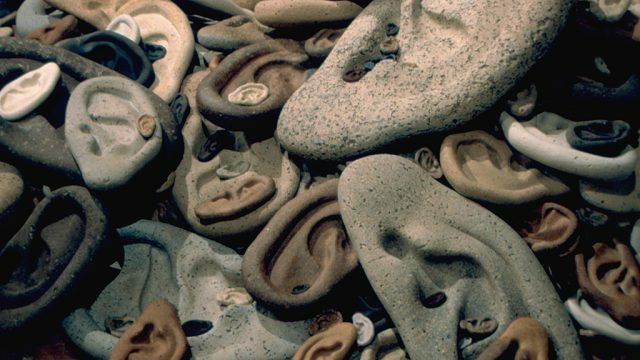 Print out or project the images, and engage students in a discussion about these artworks. What makes these weavings traditional? Discuss the form, materials, and function. Then ask students: How could you push the boundaries? What needs to be kept the same in order for it to still be considered a weaving? What could you change–scale, materials, form (2D or 3D), etc.? What would happen if you gave it an unusual form and altered the materials? Begin by having students make a traditional weaving using yarn and fabric strips on a simple cardboard or frame with nails loom. Have students make a second weaving that pushes the boundaries in terms of materials and form. Gather unusual materials for students to use to make their non-traditional weaving. Allow them opportunities to experiment and play with different ways to push the boundaries of their weaving. Once they have completed their weavings, have them title and display them. Discuss the experience of breaking away from tradition. Select a traditional object made out of clay (e.g., a cup, bowl, platter, teapot, vase, etc.). Discuss the object focusing on its form, materials, and function. Then ask students: How could you push the boundaries? What needs to be kept the same in order for it to still be considered a cup, bowl, teapot, etc.? What could you change–scale, materials, form, etc.? What would happen if you gave it an unusual form? Have students explore various ways that they could alter the object’s form. Allow them time to sketch their ideas. Once they have developed their ideas, have them make their altered objects through hand-building and/or wheel throwing. Once they have completed their artworks, have them give title and display them. Discuss the experience of breaking away from tradition. Give each student a copy of the reflection sheet Pushing Boundaries (Community: Continuity and Change Worksheet #1). Ask students to reflect on the artwork they made using the worksheet to guide their thinking. Tea, teapots, and tea cups come in many different flavors and styles. Have students find out more about the world of tea and handcrafted teapots and tea cups. What traditions are still maintained today? How have they changed over time? Tea rituals are important in cultures throughout the world (high tea in England, tea ceremonies in Japan, etc.) and even play a prominent role in literature (Alice in Wonderland). Are hand crafted teapots and tea cups a part of these traditions? Have students find out more.